At the height of the legendary Klondike Gold Rush in Canada's frozen Yukon, another major gold rush shaped the history of northwestern Ontario -- just across the border from Minnesota. Now, a century later, the rush may be on once again. In 1899, the Rainy Lake Herald reported: "Every day brings reports of fresh finds, and every week brings news of gold bricks that would have turned old King Solomon green with envy." That same year, Canadian Pacific (NYS: CP) published a leaflet entitled "The Gold Fields of New Ontario," touting a "wonderful richness in precious metals" and forecasting that "these mineralized areas of New Ontario when properly developed will astonish the world with the wealth which Nature has implanted here." 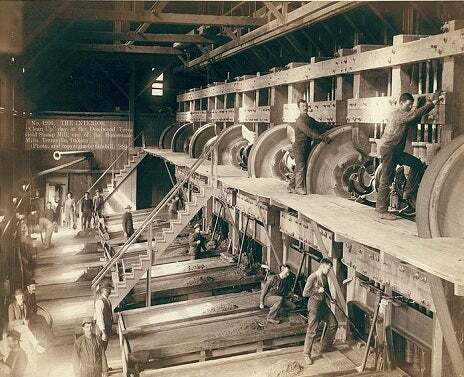 Scores of stamp mills like the one pictured below were built in the region, and fortunes were made. During Northwestern Ontario's previous gold rush, gold mills employed "stamps" like those pictured above to crush ore -- a job now completed by modern ball mills and cone crushers. This photograph, taken in 1888 by John C.H. Grabill, shows a row of gold stamps at one of three large mills processing ore from the legendary Homestake mine in South Dakota. Fortunes are being made once again in Northwestern Ontario, and an ongoing fire-sale in gold-related equities makes this an exciting time to be a prospector armed not with a pick and axe, but rather with a brokerage account and a computer. Goldcorp (NYS: GG) built a global empire from its ultra-high-grade success in the Red Lake district just a bit further North, and Rubicon Minerals (AMEX: RBY) looks to mine its own treasure at the nearby Phoenix Gold Project. Meanwhile, farther south near the winding Rainy River, which separates Ontario from Minnesota, another world-class gold project is steadily taking shape. The first time I waded into shares of gold explorer Rainy River Resources (OTC: RRFFF), back in late 2006, the stock teemed with excitement over a steady string of impressive drill assays from its namesake flagship project. I paid roughly $4 per share for my initial stake. Gold prices were beneath $650 per ounce, and more than a year would elapse before an initial resource estimate pegged Rainy River's global gold resource at 3.6 million ounces in 2008. Today, the global resource stands at an attention-commanding 7.9 million ounces of gold, and the price of gold stands dramatically higher, but investors can still pick up Rainy River Resources for just a smidge more than $4 per share! Accordingly, I've donned my waders once again for a second journey into the stock, and I encourage Fools to take advantage of this compelling value opportunity for a quality gold project that continues to progress and expand. Rainy River held roughly $100 million in cash and equivalents as of March 31, 2012, which generates a cash-adjusted market valuation of just $46 per ounce of gold in the measured and indicated category. Including inferred resources in the equation, the market has assessed a value of only $34 per global resource ounce, or less than half the valuation IAMGOLD (NYS: IAG) recently paid for a less advanced project with a lower average gold grade. I believe the Rainy River project is likely to become a mine, and each successive set of exploration results seems to support that favorable outlook. The company issued a preliminary economic assessment, or PEA, in November of 2011, envisioning a combined open pit and underground mining operation that would yield 329,000 ounces of gold per year at an average cash cost of $553 per ounce. The study suggested a net present value of $768 million (CAD 786 million) and an internal rate of return of 19.4%, using a gold-price assumption of $1,200. At a long-term average gold price of $1,600 per ounce -- which I consider an extremely likely scenario, given the stunning trajectory of this global debt and currency crisis -- the project's NPV soars to $2 billion with a bonanza IRR of 37.2%. With a current market capitalization of $364 million, the stock trades at a 54% discount to the conservative-case NPV and an 82% discount to the more aggressive gold-price scenario. But as long as the exploration drills keep turning, the company continues to add shareholder value at a steady clip, even as a grim resource equity market turns a cold shoulder. The PEA discussed above considered only those resources contained within Rainy River's June 2011 resource estimate. Subsequently, the company has already issued an updated estimate which expands the project's measured and indicated resource by 30% from 4.4 million to 5.7 million gold ounces. A revised PEA, due for release in the third quarter, is bound to sweeten the project metrics further still. Then another resource estimate incorporating recent exploration success will set the stage for a feasibility study anticipated for the first half of 2013. Exploration during the first half of 2012 was focused on infill drilling to confirm grade continuity and convert inferred resources to measured and indicated resources. Encouraging intercepts, including one grading 3.3 grams per ton over a width of 349 meters, point to a highly successful campaign in support of the forthcoming feasibility study. With the infill drilling program now complete, Rainy River's focus now returns to targeting further resource expansion, with five drills remaining on-site. Like the prospectors from a century ago, who unearthed their fortunes in this gold-rich region of Ontario, I believe Rainy River Resources will continue to strike gold. The article Prospect for Investment Gold in Ontario's Rainy River originally appeared on Fool.com. Fool contributorChristopher Barkercan be foundblogging activelyand acting Foolishly within the CAPS community under the usernameTMFSinchiruna. Hetweets. He owns shares of Goldcorp, IAMGOLD, Rainy River Resources, and Rubicon Minerals. We Fools may not all hold the same opinions, but we all believe that considering a diverse range of insights makes us better investors. The Motley Fool has adisclosure policy.